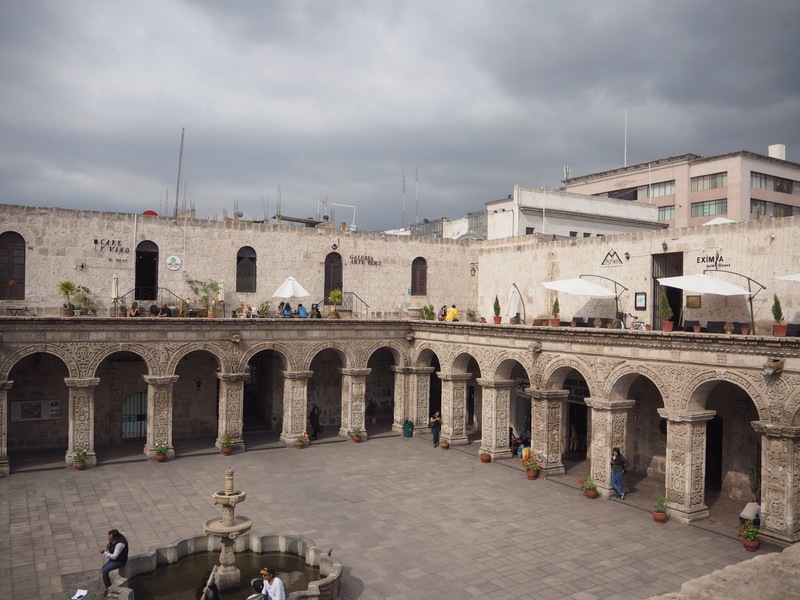 Arequipa, the so-called ‘white city’ of Peru, where many houses are made of a beautiful whitish volcanic rock, caught our fancy almost immediately. We had no expectations, and this is often the best way to go! Our few days there were amazing, partly because our hostel, Friendly AQP, had feather duvets and pancakes for breakfast, but also due to the general atmosphere of the city, feeling young and surprisingly hipster, with gorgeous architecture and – who would have thought – incredible chocolate. 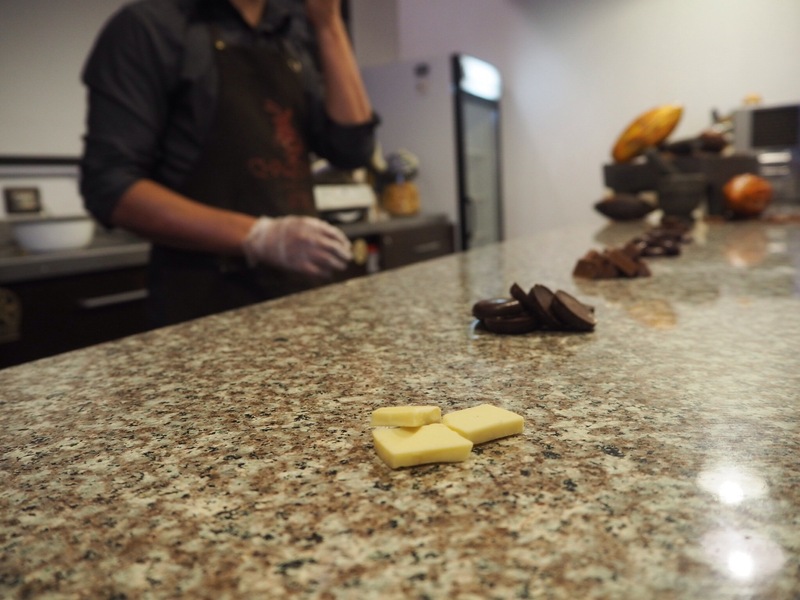 The chocolate shop Chaqchao is located in a little courtyard in the centre of Arequipa, and invites you in with a distinct aroma and friendly air. Peek in the back and you’ll inevitably see somebody in the process of tempering chocolate whilst you test out their various beauty products (the cacao butter lip balm made me want to eat my own lips). 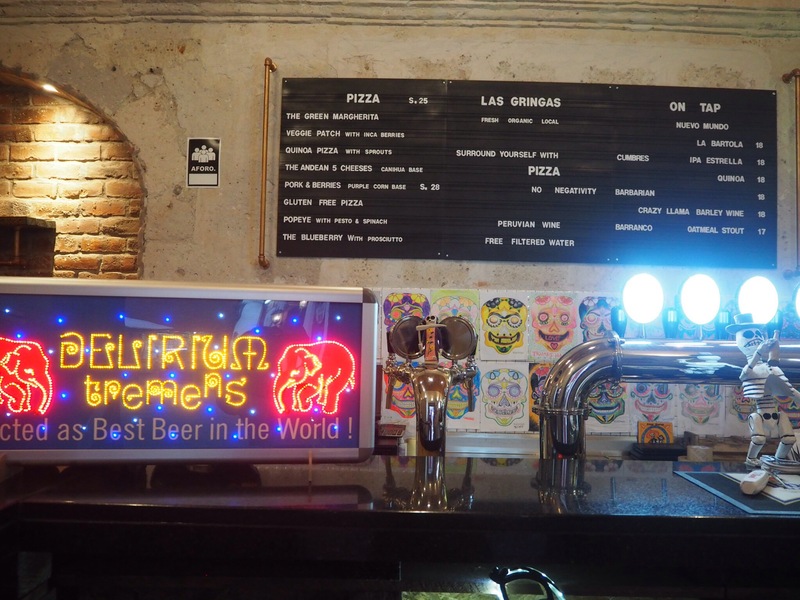 Upstairs, they have a cafe that serves the best coffee we’ve had in at least a month, and downstairs you can find the newly opened Las Gringas, an organic pizzeria with a host of unusual ingredients (more on that later). Chaqchao hosts bean-to-bar chocolate making workshops every day, and kindly invited me along to try one during our short stay. I was incredibly impressed at how it was run, and particularly with Adrian, our chocolatier who guided us through the entire thing. Internationally trained (starting out at Cordon Bleu, no less), his enthusiasm was infectious and his knowledge was nothing short of impressive. He answered every question we had without hesitation, and kept up his energy right until the end, when we were all in a slight sugar coma! 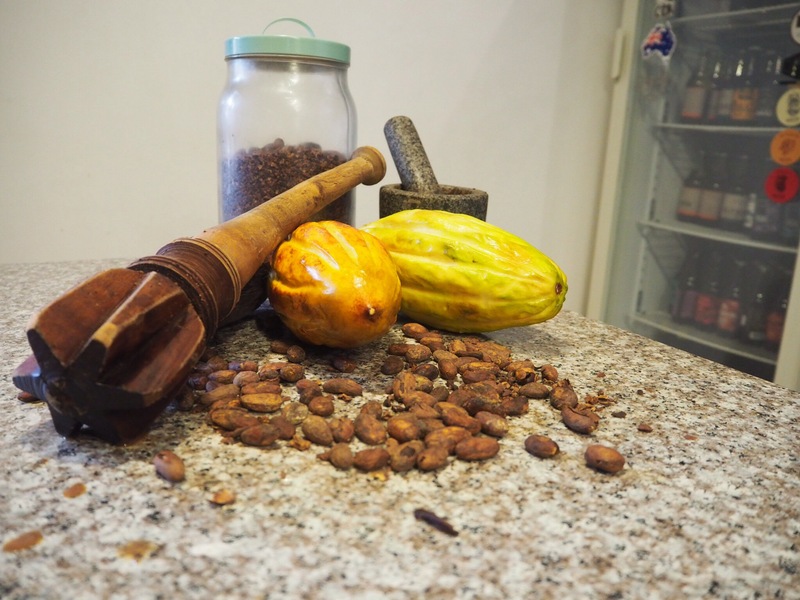 The workshop was a great mix of learning about ingredients, especially the cacao beans, the history of chocolate, and then making chocolate itself. 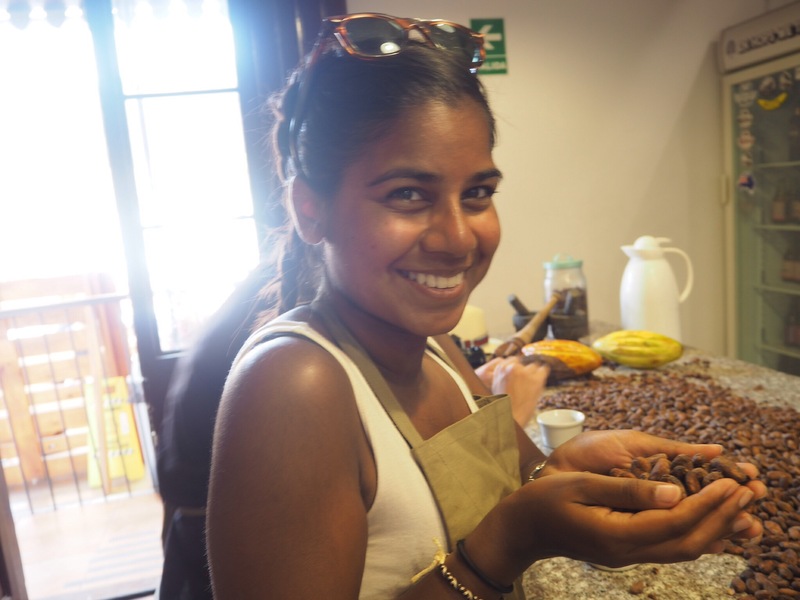 First, we got to grips with the cacao beans; feeling them, smelling them, peeling them, grinding them, and of course, tasting them. 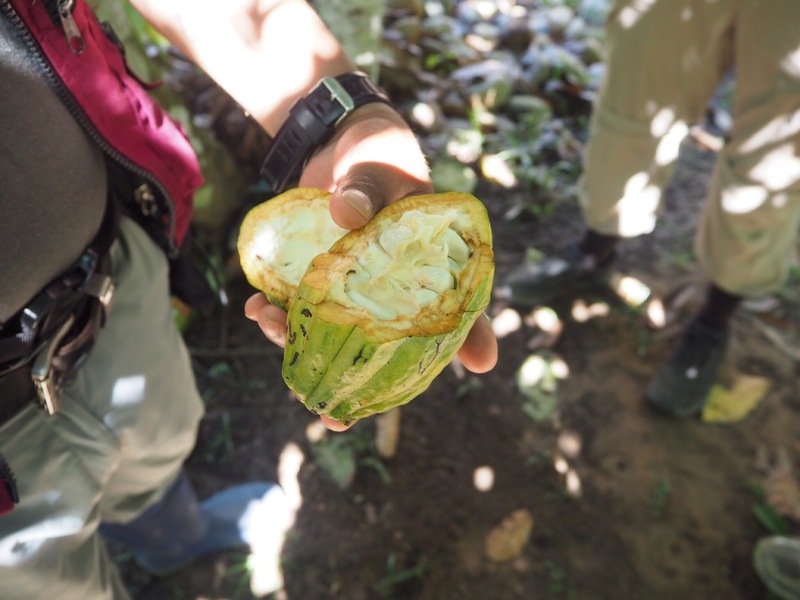 I’d actually tasted some raw cacao when we were in Rurrenabaque a few weeks ago (apparently it’s poisonous in large doses!! ), so it was fascinating to see exactly how the beans are treated after they’re picked. The smell is intoxicating… Adrian let us run our hands through the beans and smell them to our heart’s content – I could have spent the rest of the day doing the same! Now, being Swiss, I thought I knew a thing or two about chocolate, and particularly good chocolate. It turns out I’m just as ignorant as the rest of them, since Adrian kindly explained that even my favourite Lindt is technically ‘fake’ chocolate, as it includes far more than the four ingredients necessary to make the thing so many people worldwide are addicted to. After learning about those four ingredients (cacao butter, cacao mass, sugar, and powdered milk), we were made to taste test five different chocolates and determine whether or not they were real. Luckily, we had paid attention and so we passed the test! 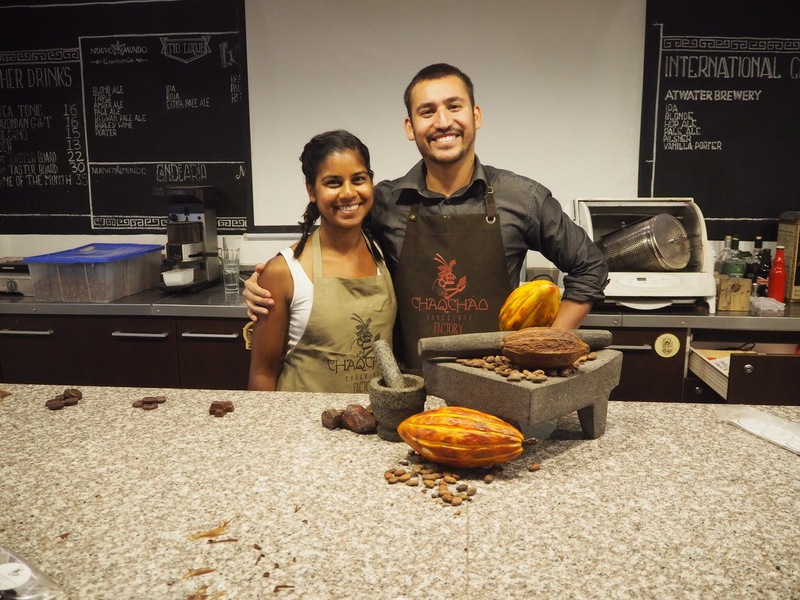 Adrian also told us all about the first product made from cacao – the Xocolatl. A favourite drink of the Aztecs, it was made with only four ingredients: cacao, chilli, sugar, and water. We recreated it on the spot and whilst it wasn’t my favourite drink (it’s hard to beat a nice Pisco Sour! 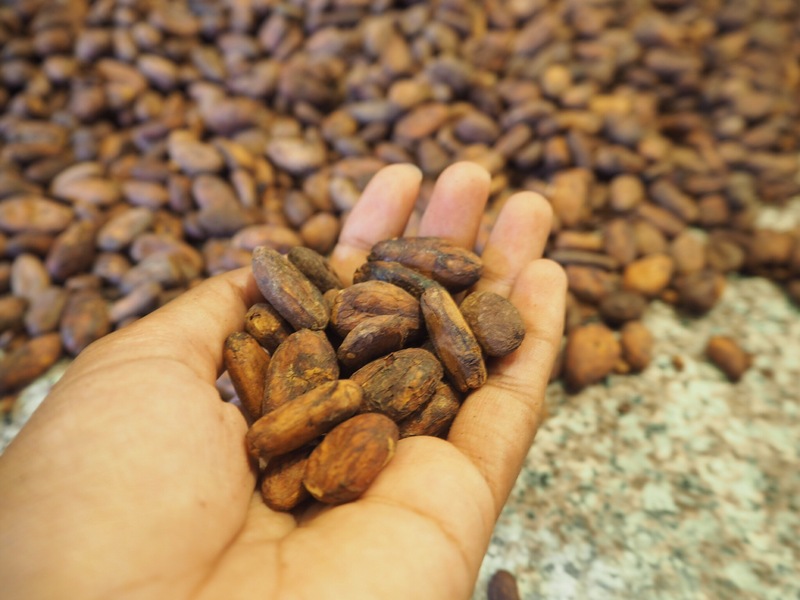 ), it was oddly satisfying and I can understand why the Aztec king wanted to be in charge of all the cacao beans! After all this education, it was time to make our own chocolates. So downstairs we went, and were given a number of ingredients to flavour our creations. 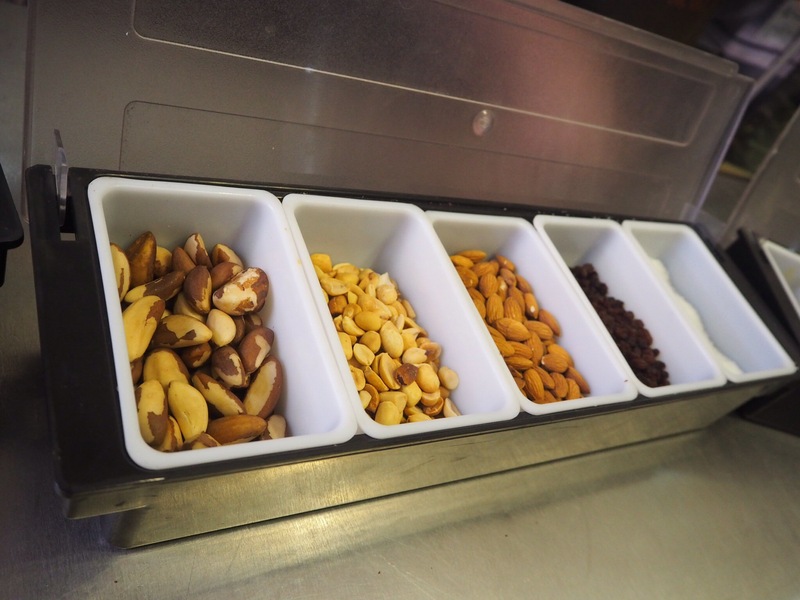 Some were distinctly Peruvian, like ground coca and quinoa, whereas others were more classic, like nuts, raisins, and coffee beans. We poured in our perfectly tempered chocolate, chilled it, and 20 minutes later, put it in a bag to take home. A worthwhile product after an educational afternoon! Adrian told us these chocolates could last up to 15 years without preservatives, but as expected, ours disappeared after about 3 days..
After so much sweetness, we were craving a savoury something, and so it was perfect that Chaqchao’s newly opened pizza place, Las Gringas, was right downstairs! 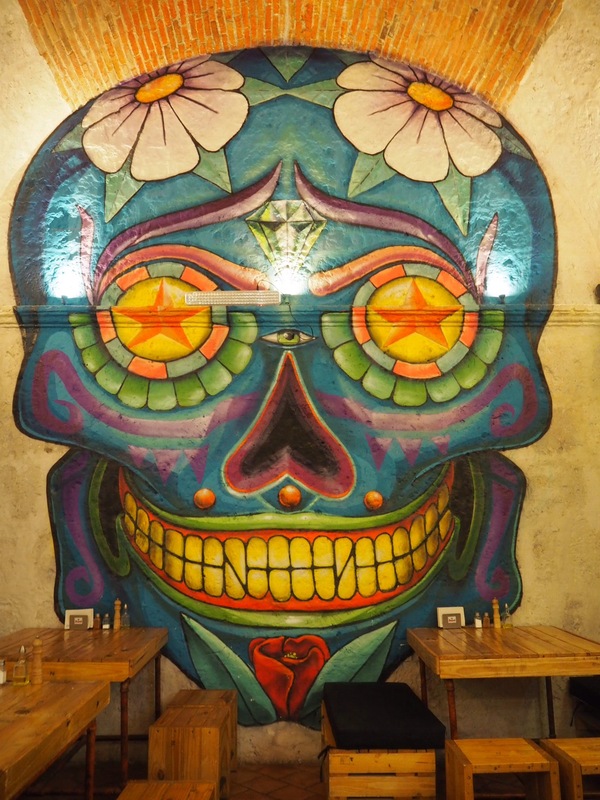 As soon as we walked in, we felt it would not have been out of place in Shoreditch, with quirky Day of the Dead decorations (inspired by a trip to Mexico, the owner Juan told us), and a menu front page we could colour in with crayons (adult colouring has become a craze due to the rise of mindfulness and childfulness). 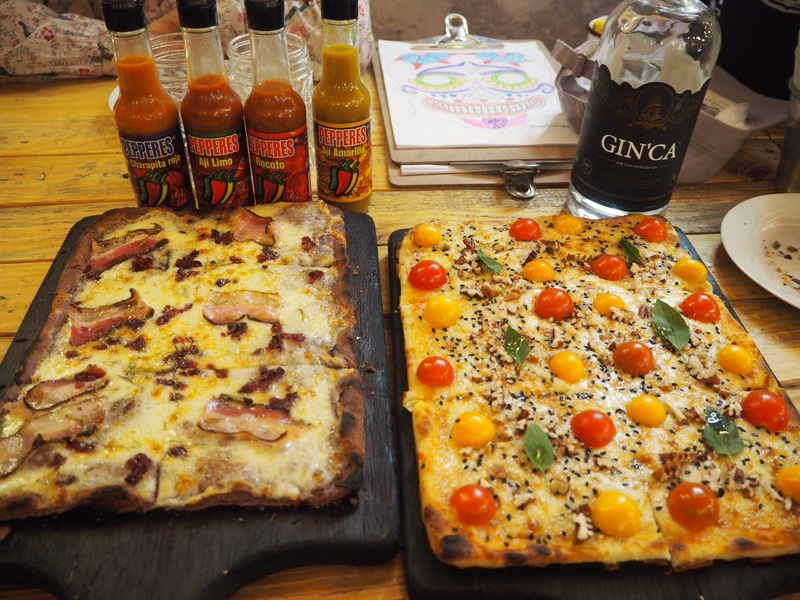 Each pizza was incredibly interesting in terms of its ingredients and combinations. There were quite a few sweet/savoury combinations, as well as vegan and gluten free options (avocado cheese, anyone?). It was hard to choose, but in the end we went for a bacon and cranberry combo, and a vegetarian delight. I absolutely loved our first choice. It was the best bacon we’ve had in South America (it’s been so hard to find!) – maple cured and meaty. The cranberries were lovely and tart and the purple corn base was surprisingly flavourful. Our other, veggie option was a winner too, as the crumbled pecan went perfectly with the sesame seeds and sweet cherry tomatoes on top. We’ve eaten a lot of pizza over the last three months, but these were surely the most interesting, and felt the healthiest due to the thin crust and fresh ingredients. If Las Gringas is ever thinking of expanding, I’m sure that the London public would lap up their creations with glee! I received a 50% discount on the chocolate making class as well as the pizza, but as always, all opinions are my own.